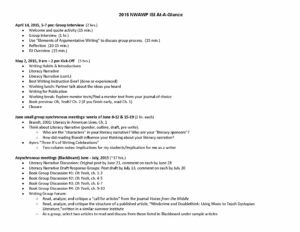 The Northwest Arkansas WP shares a schedule of a modified ISI that includes a combination of whole group synchronous online meeting times, synchronous literacy autobiography & book discussions, and traditional face-to-face meeting. 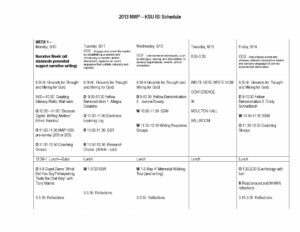 This schedule from Kent State WP demonstrates how the site modified the Summer Institute to take on a weekly focus tied to the Common Core Standards. In addition to the weekly genre focus—narrative, argument, information/expository—there are also specific standards noted for daily focus. 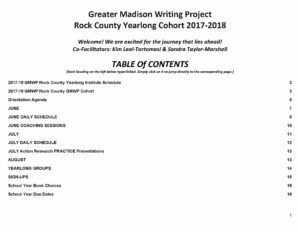 The Greater Madison WP shares a full overview and schedule for a yearlong institute, which meets for two weeks in summer followed by monthly evening meetings throughout the school year. 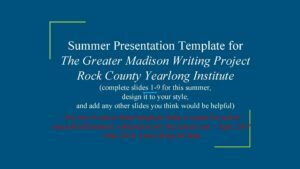 In addition, a template for sharing out action research during the summer and at the conclusion of the year is included.